The fires of Saint John’s Eve burn to cleanse the night of evil and light the way to young peoples’ romantic futures. It’s tough writing and posting during the summer when it’s so beautiful out. But there’s a special Polish tradition coming up that I can’t ignore. It celebrates the summer solstice which marks the longest day and shortest night of the entire year. What makes it interesting is that, in typical Polish fashion, it’s rooted in superstition and mysterious cultural practices. Most call it Świętojańska, Noc Kupały, or St. John’s Eve because the following day is the feast of St. John. You may have seen the Disney movie Fantasia, which contains the rather terrifying cartoon “Night on Bald Mountain,” played to Modest Mussorgsky’s composition of the same name. In it, as night falls upon a quiet mountain village, a monstrous demon emerges from Bald Mountain to devour the souls of the dead. As he does so, the deceased souls rise from their graves to dance and celebrate one last time. For a Disney cartoon, it’s certainly filled with ample horror and hell-fire. In any event, the “night” on Bald Mountain is Saint John’s Eve. This midsummer’s night, occurring every June 23, falls close to the summer solstice on June 21. People around the world have observed it for millenia. Ancient pagans believed that the day was unusually long because the sun had lost its way in the sky. As a result, a number of rituals arose to help the sun find its path again. The ancients believed that all sorts of supernatural creatures emerged on this night, leading to even more practices aimed at protecting people from evil influence. It was also a night of fortunetelling, as young people sought to discover their romantic futures through various superstitious practices. 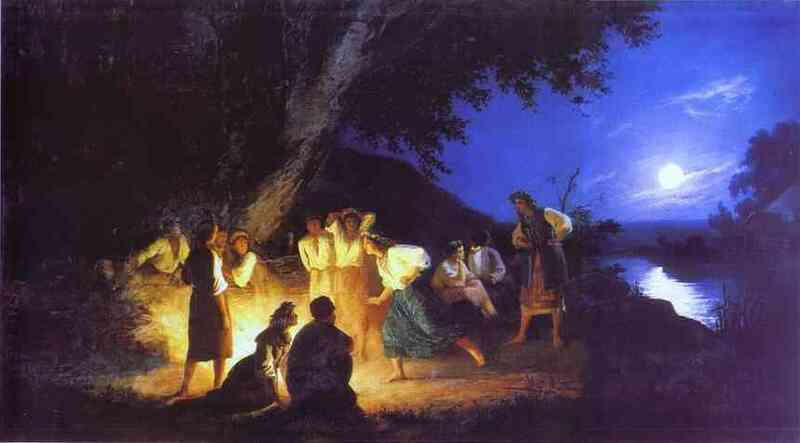 An artist’s rendering of midsummer’s night in olden days. Single girls dressed in white would throw wreaths of flowers into a river or stream. If the flowers went around in circles for a long time, the girl would remain single. If the flowers flowed quickly downstream, the girl would be married within a year. Boys would try and influence the process by diving into the water and snatching up the flowers of the girl they wished to marry. It was believed that anything you dreamed on Saint John’s Eve would come true. Herbs were believed to contain enhanced properties. People would search the woods for chamomile, white clover and coltsfoot to cure various ailments and guard against witches and spirits. 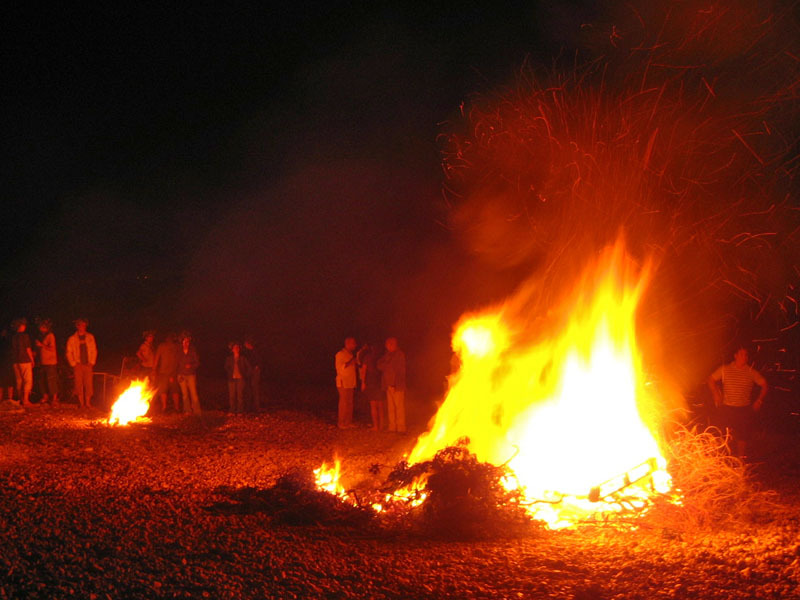 Large bonfires were the main spectacle on Saint John’s Eve. If you traveled back in time to an old Polish village on this night, you would see innumerable blazes interrupting the night’s darkness. Today, the fire’s light stands for the light of Saint John the Baptist, but in ancient times, it was meant to ward off the evil spirits that roamed free on that night. Young men and women would jump over the fires holding hands. If they managed to jump over without letting go, it was believed they would marry. Although most people probably don’t actually believe in the old superstitions, they still have fun suspending belief and pretending. Like Halloween in the United States or Day of the Dead in Mexico, Saint John’s Eve is a great way to kick back and enjoy the season with family and friends. Check out this recreation of how Noc Świętojańska would have been celebrated in ancient times. And the sun shine throug.